Last week, I introduce you the use of the most simple technique Simple moving average for day trading. 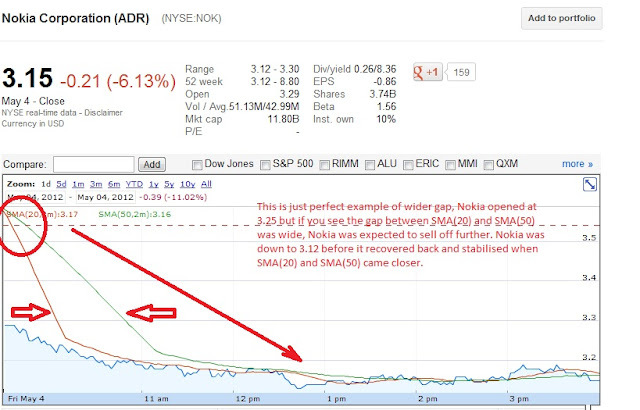 To learn more about SMA check out http://www.freefdawatchlist.com/2012/04/understanding-simple-moving-average-sma.html Also, check out stocks listed on the homepage of http://www.freefdawatchlist.com "If you expect stock to go up - Buy this stock" and "If you expect market to go down - Buy this stock". The picks are accurate and works in both up market and down market. In this article we'll analyse GMCR, UVXY, TVIX, BODY and NOK using SMA. 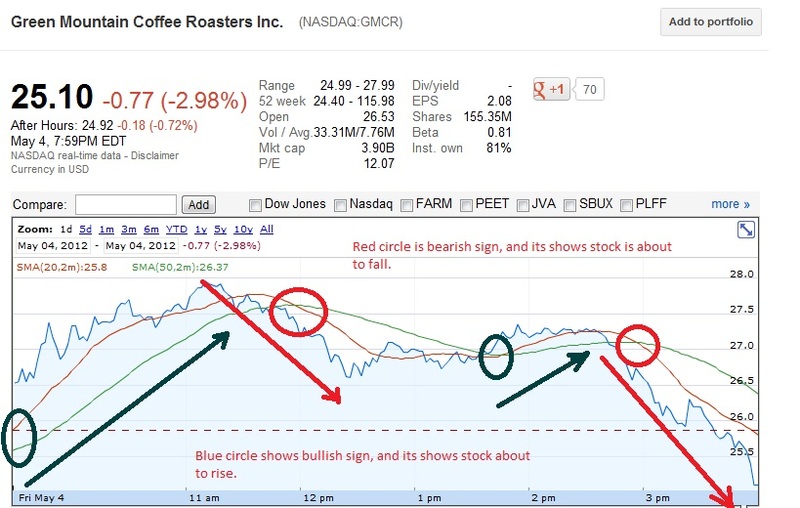 The first stock is GMCR: Red circle represent bearish sign, when sma(50) green line is above sma(20) red line, while blue circle represent bullish sign, when sma(20)red line is above sma(50)green line. If you look at GMCR chart you'll see, when its best time to hold the stock, and when its best time to sell to maximise your profit. 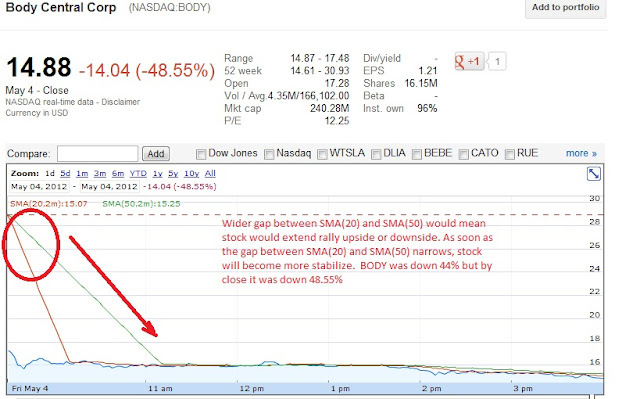 GMCR was up 8% today and at the close it was down 3%. GMCR chart for May 4th. 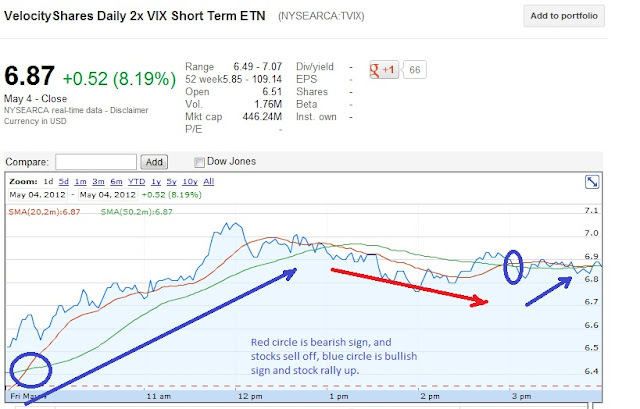 TVIX started rallying upside as SMA(20) was above SMA(50). Since VIX is in Contango after rally till 7.07, it pulled back a little before it extended the rally again. 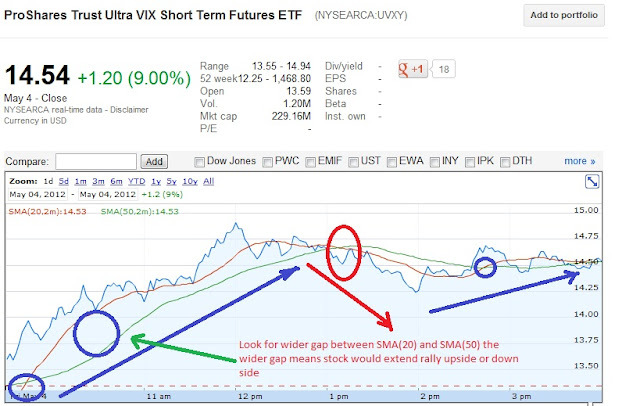 VIX needs to jump another 20% in order to go in backwardation where vix rises very rapidly without pullback. UVXY extended rally before it sold off because of contango effect. Look for wider gap between SMA(20) and SMA(50) to know whether rally will extend upside or downside. Because of the low volume, you need to have lot of patience to enter a stock and exit a stock as the movement of price is slow. Remember to sell as soon as you make 2-3% profit rather then taking 5% loss. If you are in profit, then use stop loss instead of direct sell to maximise your profit. Stop loss also restrict you from extending loss. You cannot predict sudden unexpected downfall or rise in the stock but using SMA you can visualise the up or down movement of stock accurately. I haven't perfected it, I am still learning but this simple technique has helped me alot in my day trading. If your looking for daily 2-5% swing then you should use this technical indicator. You can join our live discussion during market hours http://www.freefdawatchlist.com/p/live-discussion-breaking-news.html Also please visit our sponsor at the top or side bar if you like any article.